The Gun Control Act (18 U.S.C. sec. 923d) gives the Bureau of Alcohol, Tobacco and Firearms the power to regulate firearms dealers. The BATF issues federal firearms licenses that allow dealers to receive guns through the mail and resell guns and gun parts (with some exceptions). 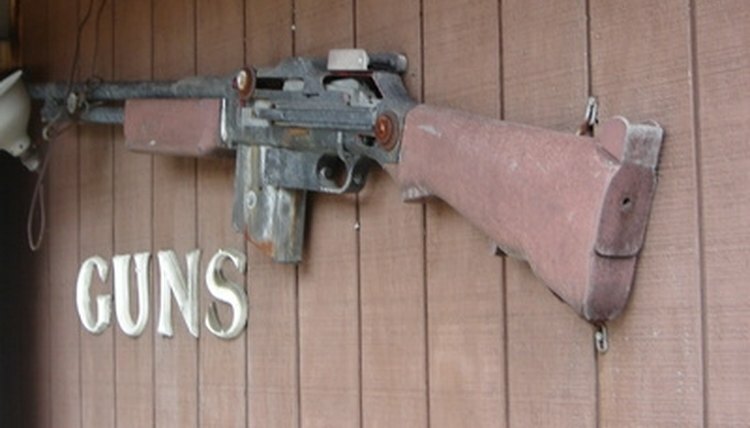 Georgia gun dealers must obtain a license from the Federal Firearms Licensing Center in Martinsburg, West Virginia. The FFLC was moved to Martinsburg from Atlanta in September 2008. Ensure that you meet all minimum requirements: You must be 21 and may not currently be prohibited from owning, receiving or shipping firearms. You may not have willfully violated the Gun Control Act. You must have premises for conducting business and you may not lie or willfully misrepresent or omit information from your application. You must intend to comply with all laws of the State of Georgia and your local government. Determine the type of license you want to receive. Licensees may be classified as a dealer, pawnbroker, collector of curios and relics, manufacturer of ammunition for firearms, manufacturer of firearms, importer of firearms, dealer in destructive devices, manufacturer of destructive devices or importer of destructive devices. Obtain ATF Form 7, Application for License, or ATF Form 7CR, Application for License (Collector of Curios or Relics). These forms are not available online but may be requested online at www.atf.gov/forms/dcof/. Alternatively, you may call the FFLC at 301-583-4696. You will receive an application packet in the mail. Complete ATF Form 7 and attach all required documentation. You must provide your name, address, county of residence and the address of your place of business, if different from your home. You must include a full set of fingerprints, taken and signed by a local law enforcement agency, on the provided fingerprint form. You must certify that you will follow all laws of the State of Georgia your local government and that neither entity prohibits the running of your business. You must further certify that you will provide secure gun storage for all firearms. You must notify the head of your local law enforcement agency (the sheriff of your county or chief of your city police department, depending on where you live) of your intent to apply for a FFL. Include your fee. Fees vary based by license type. The most commonly issued license class (dealer) cost $200 in 2010. You may pay by check or money order. Mail your completed application packet to the Federal Firearms Licensing Center. If approved, your license will be sent to you at the address listed for your place of business. If you are denied, a letter explaining the reason for your denial will be sent to the same address. Worth, Maggie. "How to Obtain a Federal Firearms License in Georgia." , https://legalbeagle.com/6600945-obtain-federal-firearms-license-georgia.html. Accessed 24 April 2019.